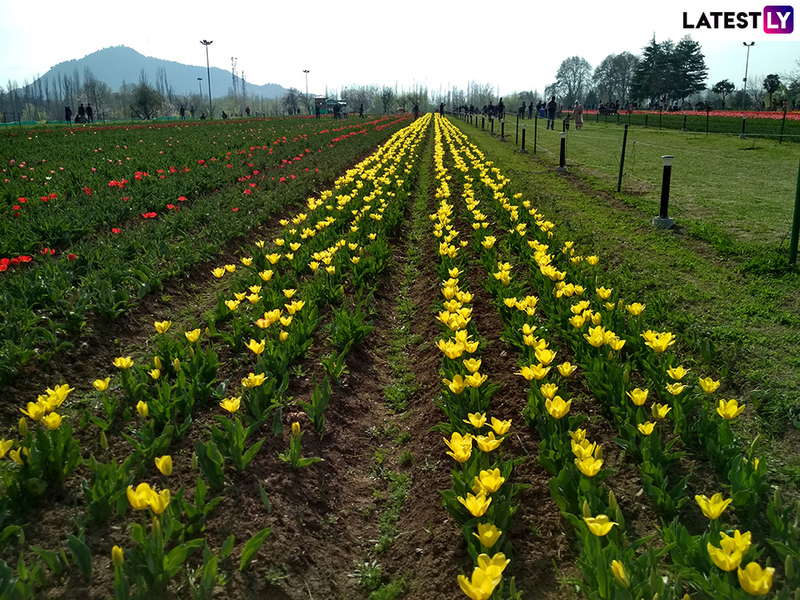 Tulip gardens located on the banks of the popular Dal Lake in Kashmir have laid a colourful carpet in the valley. The flowers primarily in the colours of red and yellow have decorated the gardens. The garden which is situated on the foothills of the Zabarwan hills is ushering tourists from across the country. 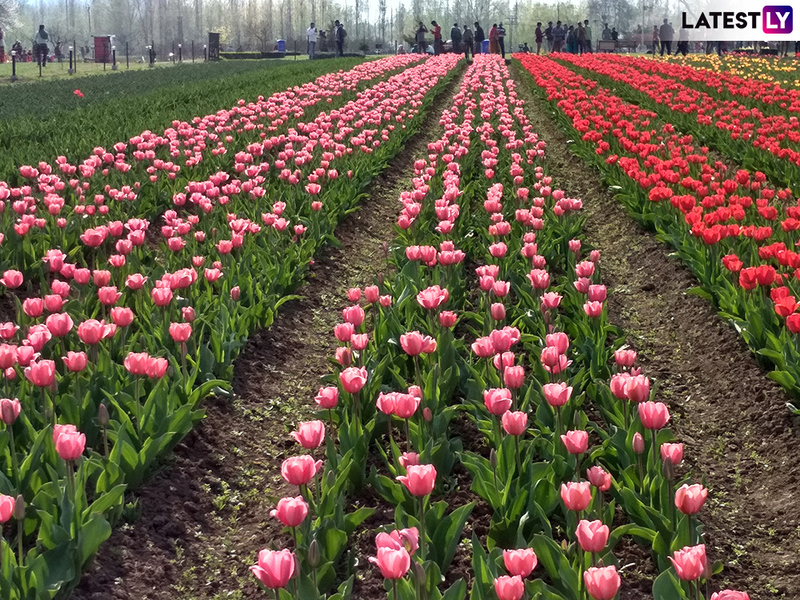 Spread over 30 hectares of land, it is known as Asia's largest tulip garden. 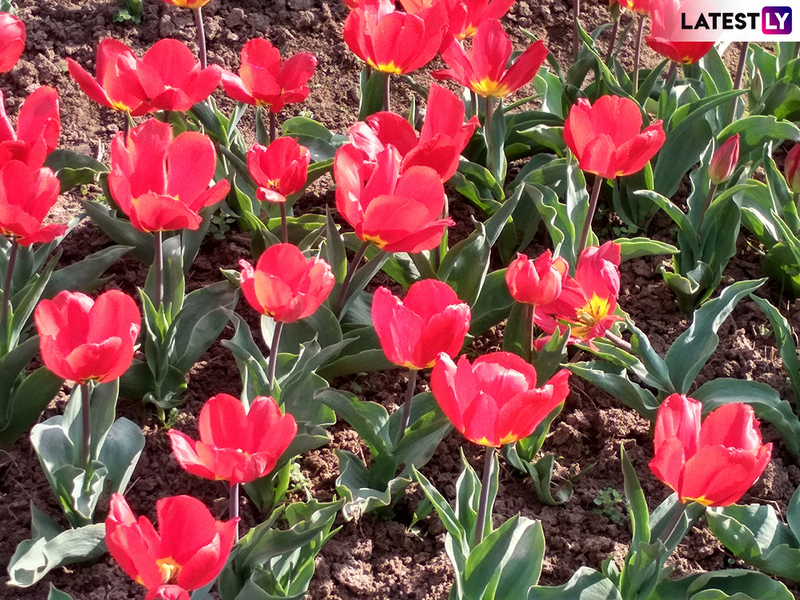 There are over 12 lakh tulips of 51 varieties in the garden. Daffodils, hyacinths and ranunculus also grow in large numbers in the garden. Only 60% of the tulips have bloomed now, it may take two more weeks for the flowers to blossom completely. With the opening of the garden, tourist season has once again begun in the Valley. On Sunday, more than 3,000 people, which mostly consisted of locals visited the garden. 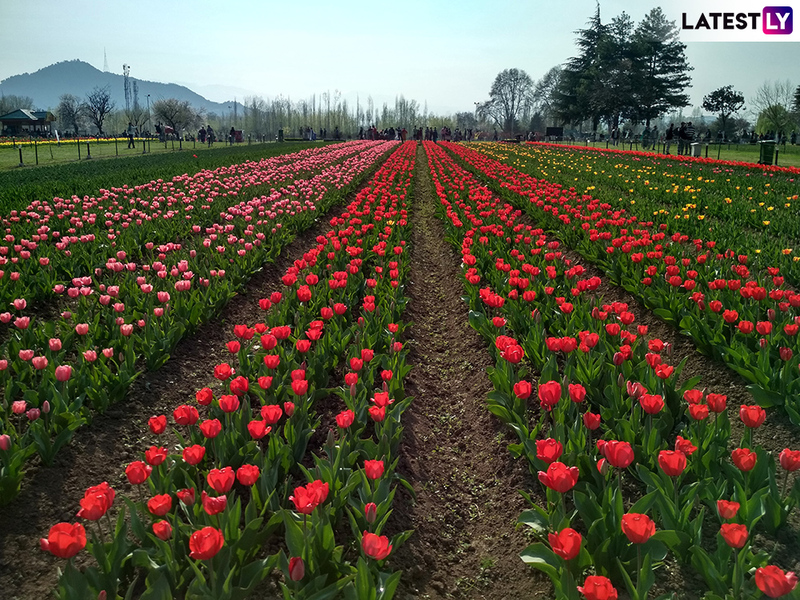 Jammu and Kashmir Tourism minister Tasaduq Mufti and Floriculture minister Javed Mustafa Mir were among the first tourists to visit the gardens. 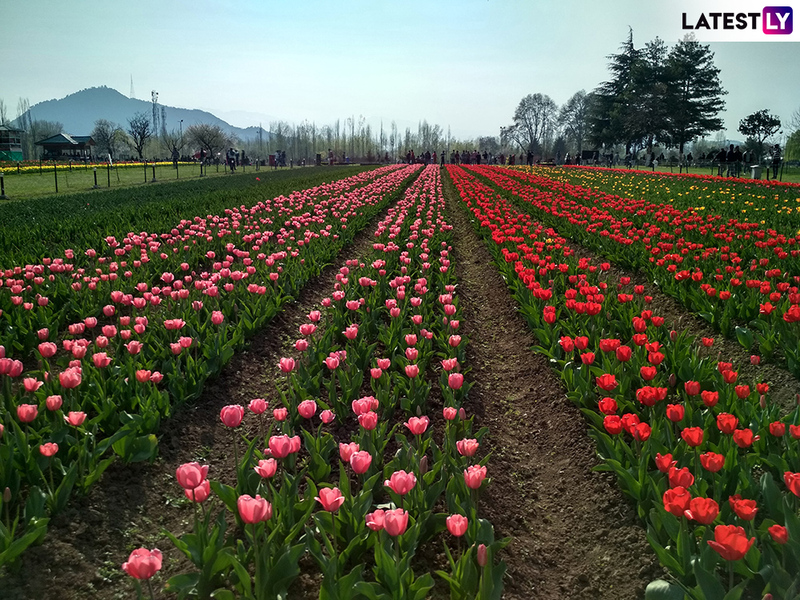 J&K’s Tulip Garden, Asia’s Largest Opens for Visitors; Marks the Beginning of the Tourist Season in Kashmir. Mir said that the floriculture department had planted 12.25 lakh Tulip bulbs of 40 varieties and colours. Around 20 percent bloom was recorded on the day of its opening. Security and traffic are well managed around the area making it easy for people to reach the gardens. PTI quoted Mir as saying, "Full bloom will be achieved in a few days. I am happy that tourists have started coming here and I expect a bumper tourist season this year." Director at the Floriculture department Mathoora Masoom said, "We have added more green spaces inside the garden so that visitors can rest and enjoy the beauty of flowers." Masoom said that 40,000 Hyacinth bulbs have been planted in a separate terrace and new fountains have also been added to the garden. She said, "We have added some other species of flowers to the Tulip garden this year. These include Hyacinths, Daffodils, Narcissus and other ornamental plants." 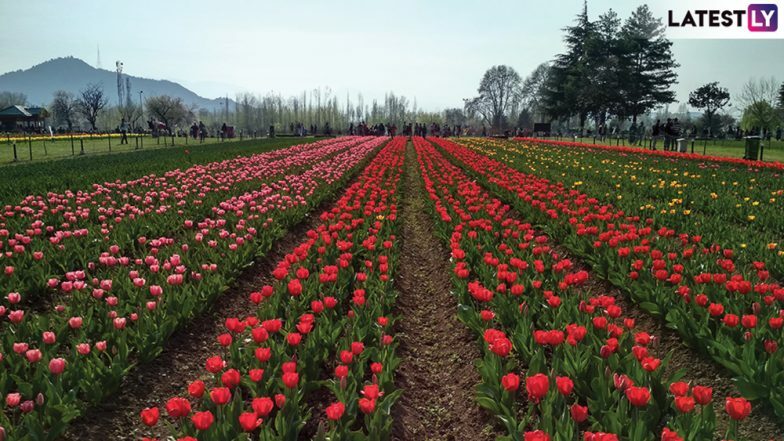 Director, Tourism, Kashmir, Mehmood Shah said, "The huge response to the Tulip garden is a good start."